Okay, I think I may have created a new vice: caramel coconut mousse pie. For real, this dessert is ridiculous and almost too darn good. This recipe combines some of my favorite fats — coconut, avocado and macadamia nuts — all together in a decadent, layered concoction. It’s perfect. The worst part, aside from trying to get it out of the pan (as you’ll see below), is when it’s gone. This dessert is worth savoring and definitely worth making again. It sets up a lot better if you wait several hours to serve it, but then the avocado layer doesn’t look as nice and green (as you’ll see below). Place all ingredients into a food processor. Blend until nuts are broken up a bit and all ingredients are well combined. Empty into a small loaf pan or small baking dish and place in freezer (Note: I used about a 4×7 Pyrex dish). Briefly soak the dates in very hot or boiling water for several minutes. Once softened a bit, carefully remove from the water with a utensil. Pit the dates and add them to the food processor once cool enough to handle. Add the remaining ingredients and process until smooth. Empty into a bowl and set aside. Place all ingredients into the food processor. Blend until smooth. Pull the crust out of the freezer and spread the caramel on top. Next, top with the mousse. Garnish with chopped macadamia nuts or shredded unsweetened coconut flakes, if desired. Serve right away, messy style, or place in fridge until ready to eat (warning: the avocado will turn brown in the fridge though). Glad I read this post! I’m going to try this. It is … makes me want to dance it’s so good! I love layered desserts!! That’s beautiful!! OMG this is RIGHT up my alley! I love love love macadamia nuts, coconut and avocado!! This also looks amazing! layered like this 🙂 I will so give this a go!! I will tweak it a little because dates upset my stomach, but I’ll replace it by something sweet nonetheless 😉 Yum.. can’t wait – haha! Happy to hear it! You can just leave the date layer out if you like. They are a bit easier to digest since they’re softened in the hot water and then pureed, but I don’t know how sensitive you are to them. You could try figs or prunes instead if those agree with you. Let me know how things turn out and what you do with the middle layer! Got it! I’m not sure how well fresh fruit will work because of the watery-ness, but let me know what you figure out. You can always just do a thicker layer of the avocado mousse. 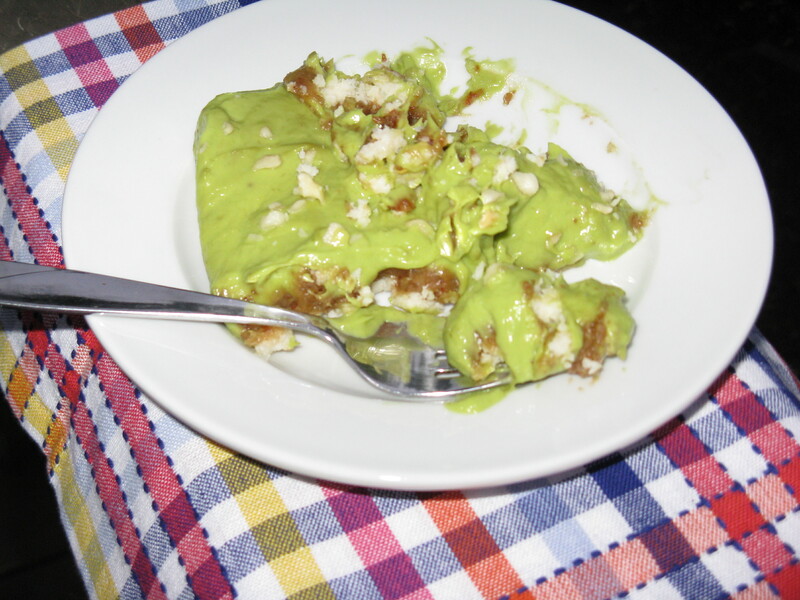 I wonder the avocado mousse would not turn brown if lemon juice or some type of acid was added. Adding lime juice to guacamole keeps it from browning so maybe the same concept would work here. Hrmmm! I’ll have to give it a shot and see. I’ve only made the chocolate avocado mousse and the cocoa hid the color change. Still so tasty! I thought about that too, but I didn’t want it to change the flavor of the dessert. It still tastes just as good once it turns brown, it’s just not as pretty! It’s fine for just at home, but if I were serving it to other people, I’d definitely care a bit more. I can’t eat cocoa, but otherwise that would be a great idea. Anyway, if you make this and try it with a little citrus, let me know how it turns out! Omg can you please pop some in the post for me 😉 that looks so good!! Haha! It is good … so good, it’s almost stupid, if that makes any sense. This looks AMAZING. I’m doing a Whole30 right now, so, yeah, bookmarking this for later. Delicious! Wonder if a little lemon juice in the mousse would help? It would help to a degree, I’m sure. I didn’t try it because I didn’t want it to alter the flavor, though I’m sure it’d taste fine, in reality.